Leverage on Citi globality and expertise to achieve your financial goals. Maintain S$70,000 of Assets Under Management in Citi Priority and let our professional Personal Banker help you in your wealth planning. At Citi, we celebrate milestones in your wealth journey with us. Receive cash rewards by topping up your balances. Enjoy more bonuses for transferring in unit trust holdings or building your portfolio with investment and insurance. A customer can participate in this Promotion only through his/her Personal Banker or Relationship Manager. Speak to your Personal Banker, Relationship Manager, or visit a Citi branch today. Click here for Citi Top Up Promotion Terms and Conditions.. Important Investments Disclaimers: Click here for Important Investment Information. Investments are: Not Bank Deposits • Not Bank Guaranteed • May Lose Value • Not FDIC Insured • Not Offered to US Persons • Are subject to investment risks, including the possible loss of the principal amount invested. This Promotion is valid till 30 June 2014 and only available to Citibank customers. Primary customer who deposits new funds of at least S$50,000 in a checking/savings account. Primary customer who increases his/her Assets Under Management ("AUM") with new funds of at least S$50,000 (or its equivalent) and placed the new funds into any of the eligible investment products or insurance plans as defined below. Any life insurance plans distributed by Citibank. Life Insurance Plans must be submitted between 1 March 2014 and 31 July 2014. Not applicable for investment or insurance with premiums paid through CPF. Citibank reserves the right to deduct the full amount of the vouchers that has been fulfilled in the event of cancellation/free-look of any investments or insurance plans. Primary customer who deposits new funds of at least S$100,000 in a checking/savings account. Primary customer who increases his/her Assets Under Management ("AUM") with new funds of at least S$100,000 (or its equivalent) and placed the new funds into any of the eligible investment products or insurance plans as defined below. AUM refers to the combined balances held in a client's primary accounts including Citibank Checking and Savings accounts, Time Deposits and Investments. You must effect this increase in AUM in a single month during the Promotion Period and maintain this increased AUM for a minimum of 3 consecutive months. This increase in AUM cannot be by way of any deposits made subject to Promotional Time Deposit Rates, deposits into Cash Management Accounts and Central Provident Fund investments and must be effected by a deposit of funds and/or assets from outside Citibank into the Citibank account(s). Accordingly, any transfer of funds and/or assets between Citibank account(s) are excluded. Please allow a processing time of up to approximately 4 months from the time the funds are invested for the fulfillment procedures to be completed. The fulfillment procedures need to be completed before you can collect the gift. If the increase in AUM is not maintained for a minimum of 3 consecutive months, we reserve the right to deduct the value of the gift from any of your accounts with us. A Citigold relationship starts with a minimum Assets Under Management of S$200,000. Assets Under Management refers to the combined balances held in a client's primary accounts including Citibank Checking and Savings accounts, Time Deposits and Investments. Upon starting a Citigold relationship, you will be serviced by a Citigold Relationship Manager and will be eligible to enjoy the rewards under the Citigold New Funds Promotion such as receiving Citigold Points which can be exchanged for shopping vouchers in major shopping stores including Takashimaya. Terms and conditions for the New Funds Promotion applies. 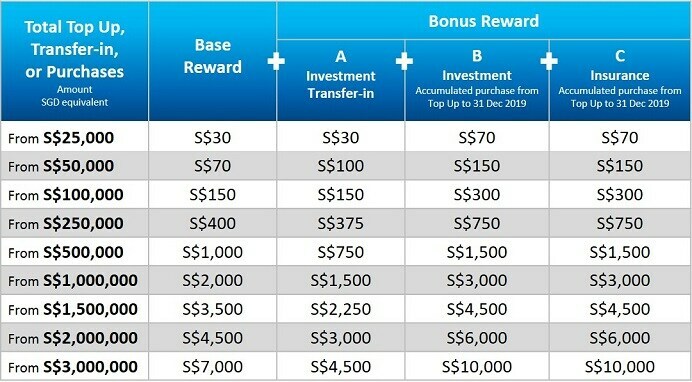 If your balance falls below the minimum requirement of S$200,000, a monthly service fee of S$50 may be levied and Citibank reserves the right to transfer your account to a Citibanking relationship at its discretion. Limited to 1 gift per primary client. While stocks last, on a first-come-first-served basis. In the event that the gifts are unavailable for any reason whatsoever, Citibank reserves the right to substitute with product of similar value without prior notice. The redemption letter must be utilized no later than the expiry date indicated on the letter and are not exchangeable for cash, credit or kind. Citibank shall not in any way be liable for any goods or services or the quality of performance of such goods and services supplied by any participating merchant, site or service provider or other authorized agent under the promotion. The eligible customer should seek redress and direct any complaints or comments in respect of such goods and services to the respective participating merchant, provider or agent. Citibank reserves the right to add, delete or change any of terms and conditions at any time. In the event of any inconsistency between any brochure and these terms and conditions, these terms and conditions shall prevail insofar as it relates to the Promotion. Top ups made to corporate accounts will not be eligible for the Promotion. United States ("U.S.") Citizens, U.S. Residents, or U.S. Green Card holders are not eligible for this promotion. A person is a "U.S. Resident" if he is present in the U.S. for more than 31 days in the current calendar year, and for an average of at least 183 days over the current calendar year and the 2 preceding calendar years. Insurance Products are not bank deposits or obligations of or guaranteed by Citibank Singapore Limited, Citigroup INC or any of their affiliates or subsidiaries. Life insurance products are not eligible for deposit insurance coverage under the Deposit Insurance Scheme. They are protected under the Policy Owners' Protection Scheme which is administered by the Singapore Deposit Insurance Corporation (SDIC). Each member of the Policy Owners' Protection Scheme maintains a register of insured policies it offers. To find out if a policy offered is covered, you can refer to the insurer's register of insured policies. For more information on the Policy Owners' Protection Scheme, please contact your insurer or visit the websites of the General Insurance Association (www.gia.org.sg), the Life Insurance Association, Singapore (www.lia.org.sg) or the Singapore Deposit Insurance Corporation Limited (www.sdic.org.sg). This is not a contract of insurance. Buying a life insurance policy is a long-term commitment. An early termination of the policy usually involves high costs and the surrender value payable (if any) may be less than the total premiums paid. Past performance of any funds or fund managers and any prediction, projection or forecast on the economy or markets are not necessarily indicative of the future or likely performance of the funds or the fund managers. Accordingly, the information should be read and construed in light of and subject to, all terms and conditions contained in the policy. Full details are stated in the policy. You should seek advice from a qualified financial adviser if in doubt. If you choose not to, you will have to take sole responsibility to ensure that this product is appropriate to your financial needs and insurance objectives. All insurance applications are subject to the insurance company's underwriting and acceptance. Not all products and services are available in all jurisdictions. Investment products are not available to U.S. persons. Investment products are not bank deposits or obligations of or guaranteed by Citibank Singapore Limited, Citigroup, Inc or any of their affiliates or subsidiaries unless specifically stated. Investment products are subject to investment risks, including the possible loss of the principal amount invested. Past performance is not indicative of future results, prices can go up or down. Investors investing in investment and/or treasury products denominated in non-local currency should be aware of the risks of exchange rate fluctuations that may cause a loss of principal when foreign currency is converted back to the investors' home currency. This document / communication / presentation does not constitute the distribution of any information or the making of any offer of solicitation by anyone in any jurisdiction in which such distribution or offer is not authorized or to any person to whom it is unlawful to distribute such document or to make any offer or solicitation. All applications for unit trusts are subject to terms and conditions specific and must be made on the application forms accompanying the prospectus or otherwise prescribed by the issuer. Not all products and services are available in all jurisdictions. By responding to this advertisement and providing your personal data, you consent to Citibank Singapore Limited ("CSL") contacting you to market you with more information on CSL products and services including via the telephone. Singapore dollar deposits of non-bank depositors are insured by the Singapore Deposit Insurance Corporation, for up to S$50,000 in aggregate per depositor per Scheme member by law. Foreign currency deposits, dual currency investments, structured deposits and other investment products are not insured. For more information, please refer to SDIC's website at www.sdic.org.sg. The higher rate of interest you may earn in the Premium Account as compared to a traditional time deposit may not compensate you for the foreign exchange loss. The Premium Account is not an insured product under the provisions of the Deposit Insurance and Policy Owners' Protection Schemes Act 2011 of Singapore and are not eligible for deposit insurance coverage under the Deposit Insurance Scheme. Investment and Treasury products are not available to US persons. Investment products are not bank deposits or obligations of or guaranteed by Citibank Singapore Limited, Citigroup Inc., or any of their affiliates or subsidiaries and are subject to investment risks, including the possible loss of the principal amount invested. Past performance is not indicative of future results, prices can go up or down. Investors investing in funds denominated in non-local currency should be aware of the risk of exchange rate fluctuations that may cause a loss of principal. This document does not constitute the distribution of any information or the making of any offer or solicitation by anyone in any jurisdiction in which such distribution or offer is not authorized or to any person to whom it is unlawful to distribute such a document or make any offer or solicitation. Investment products are: Not Bank Deposits. Not Bank Guaranteed. May Lose Value. Not Insured By Any Government Agency. Not subject to the provisions of the Deposit Insurance and Policy Owners' Protection Schemes Act 2011 of Singapore and are not eligible for deposit insurance coverage under the Deposit Insurance Scheme. Investment and Treasury products are not available to US persons. Insurance Products are not bank deposits or obligations of or guaranteed by Citibank Singapore Limited, Citigroup INC or any of their affiliates or subsidiaries. Life insurance products are not eligible for deposit insurance coverage under the Deposit Insurance Scheme. They are protected under the Policy Owners' Protection Scheme which is administered by the Singapore Deposit Insurance Corporation (SDIC). Each member of the Policy Owners' Protection Scheme maintains a register of insured policies it offers. For more information on the Policy Owners' Protection Scheme, please contact your insurer or visit the websites of the General Insurance Association (http://www.gia.org.sg ), the Life Insurance Association, Singapore (www.lia.org.sg) or the Singapore Deposit Insurance Corporation Limited (www.sdic.org.sg). An early termination of the policy usually involves high costs and the surrender value payable (if any) may be less than the total premiums paid. Past performance of any funds or fund managers and any prediction, projection or forecast on the economy or markets are not necessarily indicative of the future or likely performance of the funds or the fund managers. Accordingly, the information should be read and construed in light of and subject to, all terms and conditions contained in the policy.